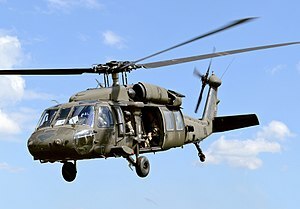 At about 9:30 a.m., a U.S. Army UH-60 Blackhawk helicopter landing’s rotor wash kicked up wind, causing a tent structure to blow over and collapse, Fort Hunter Liggett officials stated in social media posts. The accident did not result in any fatalities. The majority of the injuries are minor and are being treated in the field or at the Army post’s Troop Medical Clinic. However, two soldiers were airlifted to Fresno and two were transported on the ground to Twin Cities Medical Center in Templeton. On Thursday morning, officials posted an update stating all soldiers involved in the incident had been released to their units. Located in southern Monterey County, Fort Hunter Liggett is the largest U.S. Army Reserve Command post. Wednesday’s accident occurred during the annual Combat Support Training Exercise, which trains Army Reserve and Army National Guard soldiers. I’m glad that no one appears to have been seriously injured. Rotor wash can really ruin your day. Had this been a Chinook’s rotor wash, it could have been a lot worse. Someone will have to answer for why this happened. Either the tent was set up improperly, the aircraft was too close to the tent, or both, but someone messed up.